Network looks big but its just one shooter copied 10 times and one plume copied 10 times. Did it this brute force way so I could map everything to the interface on the subnet. Pretty much just direction controls, some noise and axis clamps. The best part is you can wedge off the control panel for procedural explosion generation. good god that is an epic explosion - heaps of detail in there! Haha I only know of vdb from openvdb so I figured that it was exportable in hou somehow! I found a tutorial on solidangle for piping out a vdb file so arnold can render it. I did some reading and it turned out vray could do the same so I figured it would work there and it seems to. Ah to export out of Houdini ic..interesting. 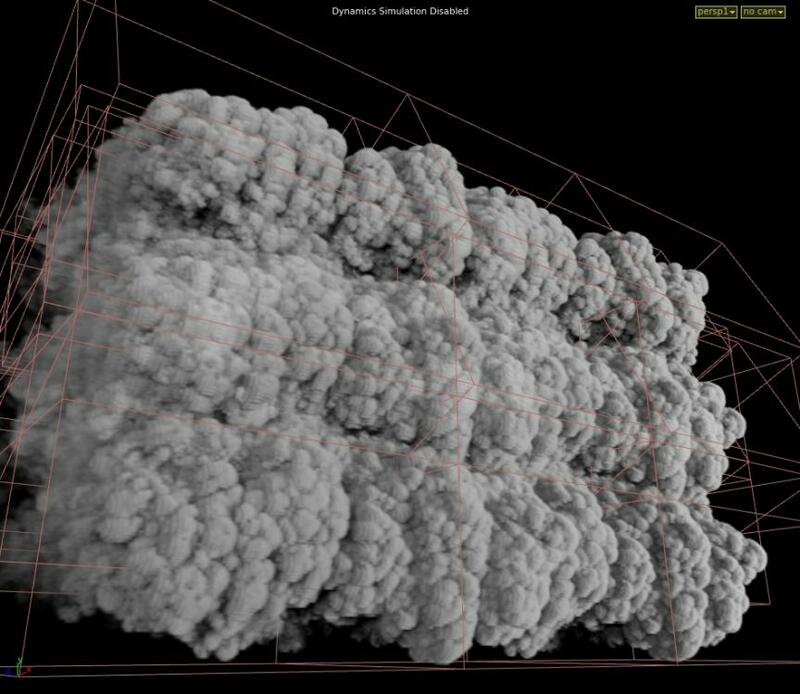 Yeh it's a cool way of getting the volume data out to other render engines. Alot of vfx houses seem to use the openvdb altho they've probably written all manner of extra stuff for it. very grateful for your Advice btw thanks again - i've just loaded my low res bgeo.sc into my upres and wow the difference is maniacal with the extra wavelet detail in there! this is my base resolution rendered in maya with vray using a hdr env and GI for lighting..
its certainly chugging processing this data but i think the results are worth it overall. I need to suss out how to get a normal pass out too so i can adjust lighting in comp - and i've got a zdepth pass too. you can fake scale by just copy your cache ( transform cache and merge with pre-transform, repeat) really essential trick. Excellent I'll give those tricks a shot! The one about merging and pre transforms has lost me tho but the result is very cool! I'll try the sharpen trick in comp.. my final res is 2580x1080 so I need every trick in the book to make it look slick! It is simply this..rotate/move your cache and merge back. yap its the dumbest trick in the book LMFAO but I do it literally every time. that's like the main trick to pulling off large scale clusters ( as far as I know ) copy-stamping clusters with time warps and blendshapes. I'll have to resist that clip lol! But yeah I can imagine they just go sod it and grind the entire server to its knees to do stuff that big! then i've done the base resolution sim (middle) - caching it out as a .bgeo.sc - seems to work all okay. then i'm using the upres network but and pointing the gas upres node to my low res .bgeo.sc with the FILE option as a source - as was described above. i think i'm gonna need to look into this copy/duplicate trick you done there James - i'm getting some nice results but i still would need to crank up the resolution massively for it to hold up at 2580x1080 pixels (that'll teach me!) so i think i'm gonna need to do a slightly more 'contained' sim ball of pyro smoke, then duplicate copies moving out wards in my moon-arc shape thingy maybe ?